Eugene Kash (Eugene Leon Kash) was a Canadian violinist, violist, conductor, and teacher born (in Toronto, Canada) on May 1, 1912. He was one of the lesser-known students of Bronislaw Huberman and Otakar Sevcik and was a champion of childrens’ music education programs. He was also the father of children who became actors – in the style of Efrem Zimbalist. His earliest violin studies were with Luigi Von Kunits (Serbian violinist and first conductor of the Toronto Symphony) until about 1928. He then went to the CurtisInstitute, where he studied with Albert Meiff (who also taught Iso Briselli and Oscar Shumsky) until 1931. Thereafter, he studied in Europe (with Sevcik and Huberman) until about 1934. He was then 22 years old with 16 years of study under his fingers, so to speak. However, he continued to study (sporadically) with William Primrose (London), Kathleen Parlow (Toronto), and Dmitri Dounis (New York.) (For a time, it was the custom of some students at the Curtis Institute to take lessons from D.C. Dounis, although they did it surreptitiously. Those who got caught were disciplined or expelled from Curtis. I don’t know whether Kash was one of those students.) He played in the Toronto Symphony (and the Canadian Broadcasting Company’s radio orchestras) from 1934 until 1942, presumably in the first violin section. Kash was concertmaster of the Ottawa Philharmonic from 1944 until 1950, when he became its conductor. He was 38 years old. He remained in Ottawa, as conductor, until 1957. Nevertheless, he had remained active as a recitalist from the beginning of his professional career. From 1946, he began developing educational music programs (or concert series) especially suited to children. CBC television ran a series from 1955 to 1958 which Kash developed called “The Magic of Music.” Almost simultaneously, Leonard Bernstein in New York was lecturing for the Omnibus children’s music series with the Symphony of the Air, sponsored and broadcast at various times by the CBS, NBC, or ABC TV networks. From 1961 to 1975, Kash took part in the Casals Festival in Puerto Rico. In the early 1960s, he served as conductor of youth concerts in Connecticut (with the Fairfield County Symphony) and Montreal (with the Montreal Symphony.) Kash taught in various places during his career; among them are the Music Academy (Philadelphia – 1967 to 1971), York University (Toronto – 1971 to 1973), and the Royal Conservatory of Music (Toronto – 1975 to 2004.) Kash was also conductor of the Etobicoke Philharmonic (a community orchestra in Toronto) from 1975 to 1985. One source says that he was at one time conductor of the National Arts Centre Orchestra (Canada) but that information is quite inaccurate. The same source states that he taught at the Curtis Institute, which is also erroneous. Up until 2002, Kash was still performing in public. 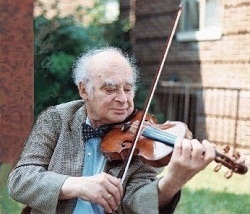 His violin of choice, acquired in 1949, was a G.B. Guadagnini of 1753. Eugene Kash died (in Toronto) on March 6, 2004, at age 91.